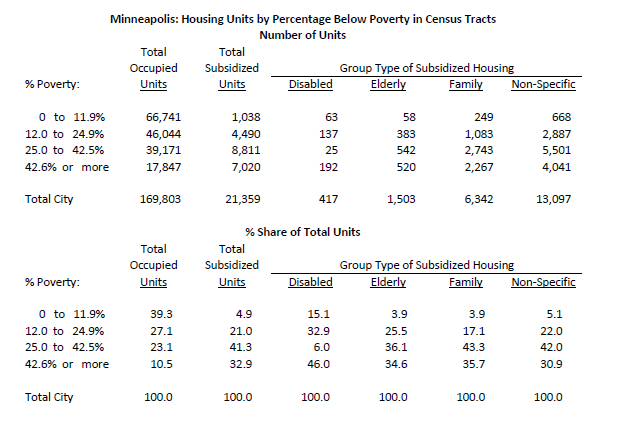 Historically, affordable housing policy in Minneapolis worked, explicitly or implicitly, to concentrate subsidized housing development in low-income and racially segregated areas. These policy helped perpetuate racial and economic segregation within the city, and insulated more affluent, whiter neighborhoods from the putative costs of subsidized development. The practice of concentrating subsidizing housing reflected a common prejudice among affluent and white families: that low-income neighbors, especially neighbors of color, would degrade property values, quality of life, neighborhood schools, and attract crime. The long-term consequence of these policies has been to deny lower-income Minnesotans residential access to some of the most affluent neighborhoods in the state, which are often served by high-performing schools and offer networks of economic opportunity. On a systemic level, the perpetuation of residential segregation helps divide the region into haves and have-nots, contributing to economic inequality, urban sprawl, and Minnesota's already-severe racial disparities. Unfortunately, the Minneapolis City Council has recently taken action to exacerbate these divides. Minneapolis operates an Affordable Housing Trust Fund, or AHTF, which provides funding for construction of subsidized units within the city. 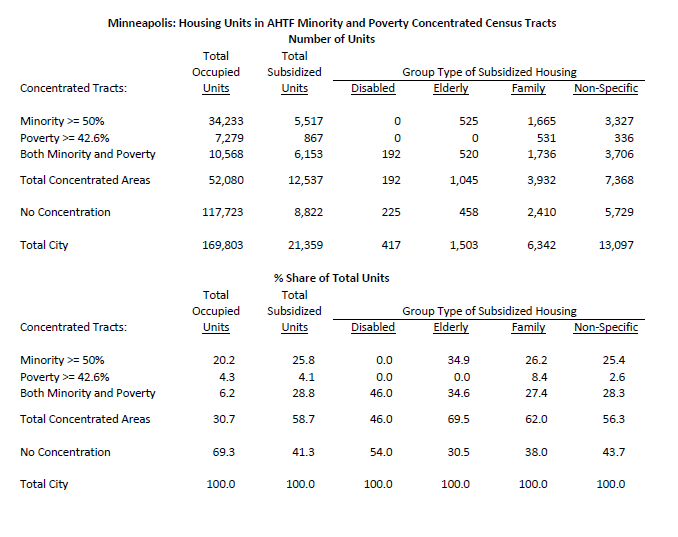 On May 11, citing gentrification fears and broader skepticism of the concept of housing segregation, the Minneapolis City Council changed the process for awarding funds from the AHTF to incentivize greater concentration of subsidized housing. It did so without public notice or comment, and without staff recommendation. The precise change involved the reduction and alteration of an "economic integration" bonus in the AHTF priority scoring system. The number of priority points awarded under this criterion was halved. Moreover, the allocation of priority points was changed. Under the new formulation, projects in areas of racial or poverty concentration will, in most cases, receive more priority points than projects outside of those areas. 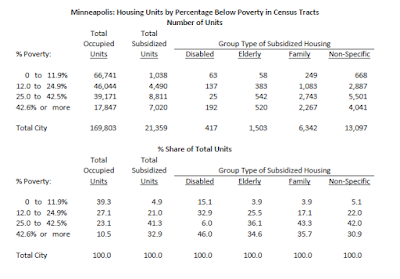 The City Council may be operating under the belief that poverty concentration or subsidized housing segregation are no longer a problem in Minneapolis. It, however, would be severely mistaken in that assessment. The AHTF funding criteria essentially divide the city into two types of neighborhoods: concentrated and non-concentrated. However, when subsidized housing siting is examined on a gradient scale, the concentration is even more obvious. The very poorest neighborhoods receive a share of subsidized housing (32.9 percent) over three times their share of all housing units (10.5 percent). 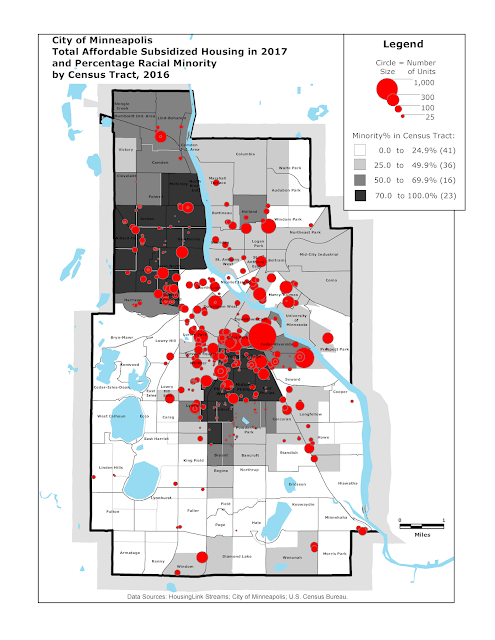 Meanwhile, nearly four out of ten Minneapolis housing units are located in areas with a poverty rate below 12 percent, but those same areas contain fewer than one out of twenty subsidized housing units. Measures of racial concentration produce similar findings. 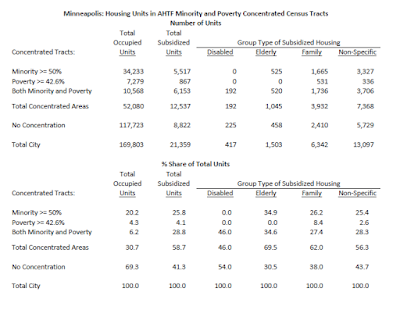 Only 26.4 percent of Minneapolis housing is located in neighborhoods in which the majority of the population is nonwhite, but those areas contain 54.6 percent of subsidized units. 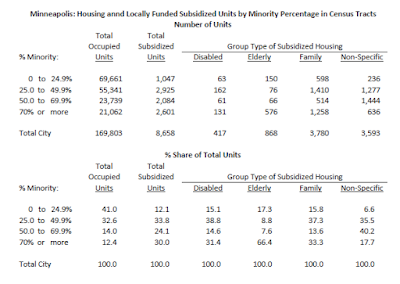 Meanwhile, areas in which more than three-quarters of the population is white contain over 40 percent of housing but 10.3 of subsidized units. This reflects the long-running success of very white neighborhoods at preventing the construction of subsidized housing within their borders. These trends are stark enough to be immediately and obviously visible on a map. The map below depicts all subsidized projects in Minneapolis as bubbles, with each bubble scaled to the number of units in the project. As is obvious, virtually no units whatsoever exist in predominantly white areas. 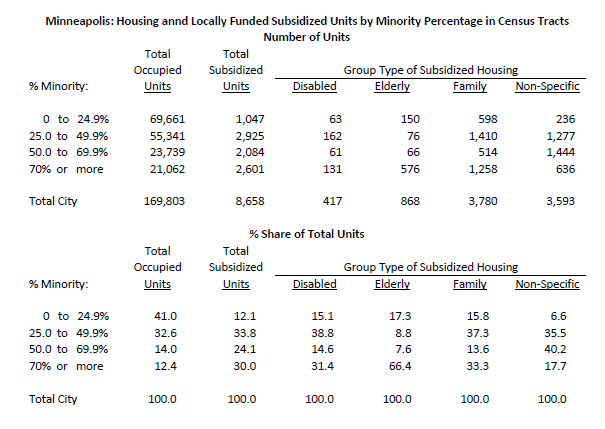 Virtually the entire subsidized housing stock is concentrated in areas of significant racial diversity. The major notable exception to this trend is recently-developed areas in the North Loop and St. Anthony neighborhoods, which have been the subject of proactive efforts to produce a mix of housing types and affordability levels.